Michael Hickey/Getty ImagesSuper Bowl champion Russell Wilson played football, basketball, and baseball in high school. 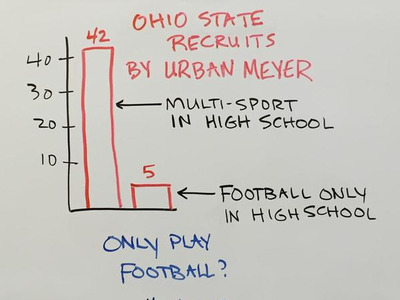 It’s common for student-athletes and parents alike to assume that focusing on one sport in high school will lead to greater chances of success on the college or professional scene. But this may not be the case. Eric Post, research assistant at the Wisconsin Injury Sports Lab and coauthor of the study, got involved in this research as he noticed an increased trend in youth sports towards early specialisation. The study focused on 302 high school student-athletes. They were put into categories based on their specialisation, or the number of sports they participated in. Of the 302, 105 (34.8%) ranked as low specialisation, 87 (28.8%) were moderately specialised, and 110 (36.4%) were defined as being highly specialised. The research team found that athletes from smaller schools were much more likely to fall into the low specialisation category. Only 25% of athletes from smaller schools were recognised as being high specialisation, while 48% of the students at large school fell into the same category. It also revealed that athletes considered highly specialised were more than twice as likely than the other categories to report a history of overuse knee and hip injuries. Participating in a single sport for more than 8 months during the year was an important factor in high injury risk of highly specialised athletes. And there isn’t any certain sport that will keep you healthier than others, according to Post and the research group. For this reason, it’s important to stress healthy training in whatever sport you or your child is playing. 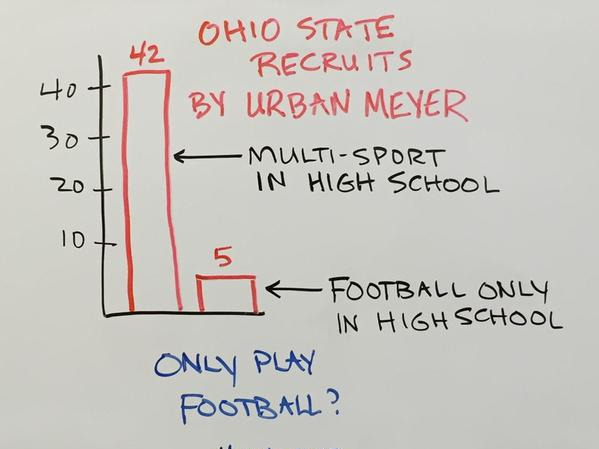 Twitter/OhioVarsityNumber of student-athletes recruited by Urban Meyer to Ohio State’s football program that were single-sport versus multi-sport athletes in high school. This news doesn’t play well for a kid focusing all of their efforts on one sport in attempts of gaining playing time at the collegiate or professional level. 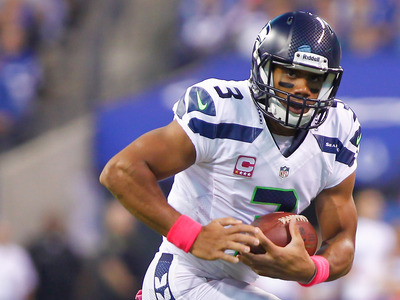 Many prevalent voices from the athletic world (like Pete Carroll, Seattle Seahawks head coach) have spoken in favour of recruiting kids in multiple sports. They see it as higher competitive drive and adaptation of more muscle groups. “Playing sports as a child is a great way to encourage physically active behaviour as an adult and to develop important social and life skills. The United States is in the midst of an inactivity and obesity epidemic, and physical activity has been shown to be an effective treatment for a variety of diseases. We don’t want to discourage anyone from participating in sports, rather we just want parents and coaches to have as much information as possible to make sport participation as safe as possible.” says Post. The group also recognises that while parents take a lot of blame for the trend in early specialisation, they are also very concerned about the youth sports atmosphere and feel little power to change the system. They feel that if they don’t get their child into organised systems at an early age they will lose opportunities to play when they are older. The next step for this particular lab group is to survey parents regarding attitudes towards specialisation as well as to follow a cohort for an entire school year to further report on injury associated with specialisation status. It’s ok to take your sport seriously, but imperative to rest or cross-train in order to prevent overuse injuries before the call for the big league even happens.